Hundreds of couples puckered up Saturday at Six Flags amusement parks nationwide to help break a world record. The theme park company set out to best its own Guinness World Records title for most couples kissing under the mistletoe. Eligible couples were invited to seven of Six Flags locations, including Great Adventure in Jackson, New Jersey. 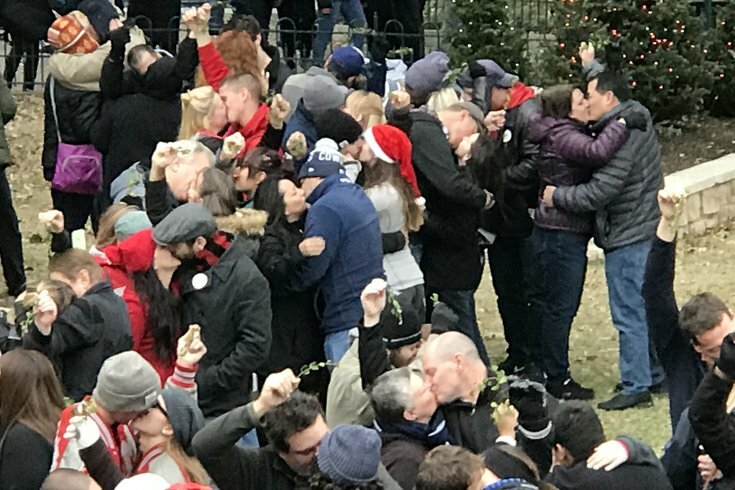 The event was a success as 1,678 people smooched for at least 10 seconds at the company’s annual wintertime celebration, Holiday in the Park. The 839 couples shattered the previous record of 201 couples set at Six Flags Over Georgia in 2015. At Great Adventure, 350 guests — 175 couples — helped contribute to the effort. Each couple received a complementary mistletoe for the event. Participants also locked lips at Six Flags Over Georgia, Six Flags Over Texas, Six Flags Fiesta Texas, Six Flags St. Louis, Six Flags Magic Mountain and Six Flags Discovery Kingdom. Great Adventure's Holiday in the Park is available until Jan. 2.